It's been a good morning so far. Up at 5am as planned, the taxi was not quite ready, but only 10 minutes late. The airport opened at 6am and I was there at 5:50am. I talked with the tower controller and Abel, the briefing officer, as they arrived. They let me through and wished me a good flight. I thanked them, especially Abel, for all his work. Out to the ramp, preflight and takeoff by 6:26am. It was a nice cool morning, +12C which I needed for a full gas departure at 4,167 feet elevation. I was on my way again. The controller bid me farewell and "good flight" at 50 miles out and I was turned over to Lusaka control. I leveled off at FL070 wanting to drop weight before climbing further. The scenery was beautiful with haze over the rivers and swampy areas and the sun just coming up (into my eyes as I was flying northeast). I could imagine the animals running around below. 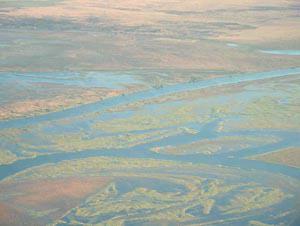 I passed over the Bamgweulu Swamp and stayed close to the edge; it didn't look too appetizing. Although I thought I saw some huts on high ground, maybe there are some people living in the reserve area. On the edges of rivers I saw camps, probably game camps for tourists. As I travelled further northeast I started to see the first hills/mountains in the distance, with the peaks just above the haze/cloud layer. I called Lusaka control, but was out of contact. I tried other stations and the air to air frequency to relay, but no one was around. I climbed to FL090 and kept calling. I finally tried Kasama approach, a nearby airport, and relayed my position. I was getting close to the FIR boundary and wanted to make sure Tanzania knew my arrival time and new altitude. With all the trouble I'd had getting the permit, I didn't want a problem flying through their airspace. As I reached the border, I called Kasama for another relay, unfortunately they were out of range. So, I called Dar-Es-Salaam control directly with my position report. Expecting the worse, I was delighted to have the nice controller wish me a good morning and confirm my position report. He asked for future position estimates and ETA at Addis Ababa. Then he said, "Are you not going to make a landing anywhere?" I confirmed that I wasn't landing. I keep cross checking the VFR chart with mountain peaks on it against the IFR chart and my airway route to make sure there is nothing ahead at my level. There is one peak above me to my right and two almost my level to the left. After I get over this range, the plateau will be at about 4500 feet and it'll be several hundred miles until I see some towering peaks at over 11,000 feet, one at 14,978 and Mt. Kilimanjaro at 19,340 feet. I'm hoping for clear VFR so that I can see them all. I'll have to climb to 13,000 feet later in the flight, but want to use up gas before climbing. Entering Tazmania, there were many small towns and some larger villages surrounded by cultivated fields. It seems that they have plenty of water and agriculture in this area. Over the mountains and onto the plateau and it seems dryer, with shrubs, but no noticeable agriculture. It's still smooth air at 10:30am and I'm hoping that the bumps hold off for a while. Four hours down and I'm a third of the way there. I pull out the breakfast that the hotel had made for me. I asked for a little something as the hotel included a full breakfast and, leaving at 5:30am, I wouldn't get it. They'd given me a small package on leaving. I'd expected toast or bread and muffins, instead, they'd prepared bacon, sausage and 2 eggs. Not easy to eat with your fingers!! But tasty never-the-less. They'd even included a small package of salt wrapped in plastic. I've found during the whole time in Zambia that they have been very eager to please; this is just one last example. It's great to see land below and watch it change in topography and vegetation as I pass. I was definitely tired of the over-water legs and am thankful that the last long one is over. I think I've taken as many pictures of barren land and I did of beaches in NZ and Australia. It looks different each time I take a picture, but they all look the same when I review them later. Got a picture of Mt. Kilimanjaro as I passed, not great as there were clouds around it, but I could see the snow capped, flat peak. Coming into "Kili" airspace, I was asked for my Kenya permit. I thought I had the number, but also thought that I'd been told that the advanced notification by flight plan was sufficient. I looked but couldn't find the permit number. They called back and said they'd found it; I breathed a sigh of relief. There are peaks in the haze and clouds and I'm constantly checking my position and the peaks - not the easiest flight I've had. As I cross into Nairobi airspace, the controller again asks for my permit number. After looking again, I finally admit that I don't have it with me and will call when I get on the ground. Here I was worried about Tanzania all the time and Kenya turns out to be the problem. He clears me straight to NAK VOR instead of overflying Nairobi, which I think is very sensible and saves time. But there are still peaks around. I climb to FL120 and keep a constant watch. Not much to see on the ground now as there's a broken layer below me. Later I have to climb to FL130 because there's a peak covered by a cloud very close to my flight path. As it's hidden and I don't know exactly where it is, I opt to climb. A right turn at the VOR and it's straight ahead to Addis Ababa only 576 more miles. It's looking lush and green below but as we travel further north, it starts to get brown and dry, very dry. When I have Lake Rudolph to my left, it's flat and brown to the right and looks deserted, at least compared to further south where there were lots of villages and towns. The clouds clear, but it's still difficult to see due to all the haze. Once I cross the border, there will still be a few mountains to pick out and avoid, so I'm hoping it stays clear and less hazy. I'm out of contact with Nairobi control and probably won't reach Addis control until well inside their air space. I kept calling Addis control, especially after reading on the charts that it is mandatory to make contact 5 minutes prior to entering their airspace. But, I also continued flying as I knew there was no way of making contact 300 miles away. I finally heard Addis calling me - phew, at least they were looking for me; but they still couldn't hear me. After another half hour, we could talk with each other. Cleared to continue to Addis, I descended into the valley, below the clouds and between the mountains. Unfortunately it was still hazy, but the brown, dry land was giving way to fields and crops. As I approached, there was just one hill higher than me and the mountains on the other side of Addis which were higher still, but I wouldn't be going that far. I was cleared down to 8,500 feet and the airport elevation was 7,600, so I didn't have much farther to go. Boy, an 11,000 foot strip is pretty long, especially where there are two parallel strips!! I saw it, turned downwind and announced my position. Turned base and final and I was on the ground after 11 hours and 11 minutes of flying. Not the longest, but one of the more worrisome flights I've had. I didn't want to become a CFIT (controlled flight into terrain) statistic, and was constantly crosschecking my position relative to the higher terrain. I was led to my stand position by a "follow me" bus, given time to organize my bags, and driven to the terminal building. The building was just opposite my position, but they don't want people walking across the ramp and taxi areas. They showed me into the door and told me to go up stairs. There was an empty terminal building with guards sitting around and nothing else. I finally made my way to immigration and explained what I was doing. They stamped my passport, marked that I was crew and said I'd have no trouble returning to my plane tomorrow - we'll see, I thought... Customs took my handwritten General Declaration document (thanks again Goeff) and accepted that I only had personal belongings. Money change was closed, so I took a cab to the hotel and paid in dollars. That was the easiest entry at a major airport!! The terminal building is extremely new, they are just moving into it in January. The cabby couldn't even get out of parking because they'd just opened parking that day and the workers didn't yet know how towork the payment machines. I finally made it to the hotel, had a beer and a local dish for dinner. Luckily, some Ethiopian friends from Orlando had taught me how to eat Ethiopian food. I didn't look like a pro, but at least I knew what to do and how to do it - tearing off the injara with my right hand, picking up the wat with the injara, and putting the whole thing in my mouth. The waiter even brought me some hot sauce after a while - maybe I impressed them enough that they thought I'd want it with their food. The first day after landing is the obligatory trip back to the airport to check on the airplane and try to understand departure procedures. This was made doubly difficult by the new terminal building and people changing offices or new in their positions. In the old terminal, no one could direct me to ATC (even though the Jepp chart showed it there somewhere). When I finally asked for the Airport Manager I was headed down the right path. I was shown to ATC, filled out the landing, navigation and parking form and paid finance. Now I had one of the pieces of paper for departure. While there, I met a Kenyan pilot who told me that I might find GA parking and tie downs down by the maintenance area where they also had small GA planes for training new pilots. I walked down there, airside and was only stopped 3 times because I wasn't in a pilot's uniform. Once there, the instructors, technical, and maintenance personnel were very helpful and showed me where I could tie down. I walked the kilometer back to departures and tried to get through each of the check points to get to the ramp and to my Mooney. Everything was simple except the guy checking airport departure tax stamps. He wouldn't believe that I was crew because I didn't have stripes on my shoulders. Even with crew written on my passport he asked for identification. Finally 2 guys from immigration who had seen me earlier saved me and convinced him that I was okay to pass. The gate people let me though and called a van to take me out to my plane. Exceedingly simple except for one person. Next time I'll buy the $1 departure tax stamp!! I taxied down to GA and a marshaller showed me to my position. A student pilot helped me to tie down and one of the technical people took me over to the admin department. The finance person looked up the hangar charges and quoted $248/day. I laughed and said that I wasn't in the hangar, I was tied down outside. Another guy said "what's the difference." I knew I was in trouble. Finally the manager came over and explained that they charge a high price to dissuade transient parking. I said that I was dissuaded and would taxi back. Upon my return, I found some big rocks at the edge of the ramp area and moved them to the plane and tied down. Of all the places I've been, I have met only very helpful people until now. But, as I think about it, all the helpful people at airports have been plane people; these were financial types. They were just doing their job. I was actually more relieved, once tied down on the ramp. This ramp was cleaner and quieter, the other was covered in gravel and had people, cars and buses everywhere. After all that, I felt ok about leaving my Mooney for a week and a half. My Ethiopian friends in Orlando had mapped out what to do while here, so I went to a tour operator recommended by their family in Addis Ababa and figured out how to make our plan work. After several tries, we found the right combination of commercial flights and days in each location. I couldn't fly privately in Ethiopia, but commercial flights aren't all that expensive. The next day I was off to Dire Dawa. Upon arrival I took a taxi the 60 kilometers to Harer and moved into the recommended hotel. The market going on reminded me of India with people, cattle, cars, goats and noise everywhere. The big difference was that we are at 7000 feet and it's cool enough to need a long sleeve shirt or light jacket. I meet my guide, Abiyu, and we head out. The old town, Muslim, and inside the wall was fascinating in history and life style. The new town, Christian, and outside the wall was not much different, still crowded and noisy. "Faranji" is shouted by many kids at foreigners. It is a word coming originally from when the French were here. I had been warned about this, but only one taxi driver had yelled it at me in Addis. Here it was over 90% of the kids yelling at me. I didn't enjoy it, nor do I enjoy crowds and noise, and was happy to leave Harer, enjoy the countryside during the ride to Dire Dawa, and return to Addis. It almost felt like home returning to my local hotel with the local internet caf� across the street!! A day later and the longer journey started. First, off to Axum in the north. What an amazing history. The guide, Haile Silassie, takes me from the pre-Axumite history starting in the 5th century through the Axumite periods 200AD - 700AD - 1100AD, explaining the time of the Queen of Sheba and her swimming pool and her liason with King Solomon of Israel. The stone stelae or monoliths, over 3000 of them, are impressive in stature and construction for that period. In one of the tombs there is an iron pin (from 5thC BC) holding two stones together. There are tunnels going over 150 kilometer in length through which kings sent material and equipment so that invaders didn't know what was being planned. The extent of findings and archeological work yet to be done is impressive. Unfortunately there are no funds or museums for display. There are currently teams from the US, France and England working 3 months on site each year and 9 months at home doing the analysis. There is so much history still covered by earth it's an amazing adventure. After our day visiting the archeological sites, Haile Silassie invited me back to his home for coffee. Little did I know what that would entail. While one sister brought out the coffee making equipment, small stool, small charcoal stove, plastic bucket, cups, saucers, tins and spoons, another brought out a plastic bowl for washing hands. I followed what Haile Silassie did, washing his hands in the bowl as water was poured over them. Then with right hand only, I put injara on the plate and his sister spooned wat over it. HS warned me that it might be hot/spicy. It wasn't bad. Just as I was about to finish, I remembered Nick and Fikirte's warning not to finish first as the hosts will ask you to take more. I slowed down, but not enough. I said that I had enjoyed it but really didn't eat much and no more, thanks. They had seconds and explained that they would eat the bones as they were good for them!! After another hand washing, the coffee session started. One sister was already roasting the beans. She had me smell them before grinding. Then she started boiling the water by fanning the charcoal - what a job. While the grounds were settling, she put some charcoal in another pot and added incense - the smoke poured out. Then she poured and served the coffee. Just prior, the first sister brought out unleavened bread which is eaten before coffee. As we drank the coffee, HS explained that it is made 3 times and the sister started boiling the water and fanning the flames again. More bread, more incense, and the 2nd cup of coffee. I had the opportunity to try to make the 3rd cup. As the saying goes, a watched pot never boils, but in my case, my fanning technique was insufficient and the sister was getting weary of watching me fail. She added a little wrist action and boiled the water. I washed the cups in the bowl, made the incense and poured the coffee. I was happy to sit down in the chair after all that - what an experience. It was an evening to remember and an experience you just can�t get without a person willing to invite you into his home. I appreciate all that HS and his sisters did to give me a real view of life in Axum. 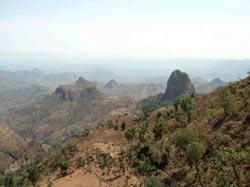 Next stop Gondar, just south of the Semien Mountains - they are majestic and rugged from the air. I was amazed at the number of homes that were dotted here and there, many more than I would have expected in the rugged terrain. King Fasilides moved the capital of Ethiopia to Gondar in the 17th century. What's left of the numerous castles stand inside embattlement walls in the middle of the city. The royal baths are a short walk away. The most famous church in Gondar is Debre Berham Sellassie, Trinity Church of the Mountain of Light, built as were many others on a hill top and decorated with paintings of scenes from the bible. Tej is the Ethiopian fermented wine with honey. As I'd read about it before leaving, I had to try some. There were only 2 places in town that serve Tej. In the Tej bar there were no lights, it was very small and everyone was sitting on benches against the wall. Johannes, my guide for the day, and I took a seat which happened to be next to the Tej barrel. The woman takes an empty gin or whiskey bottle, fills it from the barrel, and serves you the bottle and carafe shaped glasses. It tastes sweet from the honey and also has some other spices mixed in. We moved outside where a number of older men were sitting on stone benches. Johannes explained that this tends to be an "older man's hangout." We talked and drank -- it was another interesting evening. 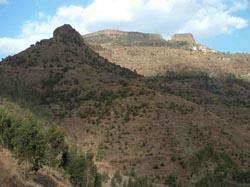 The next day was a drive to and trek in the Semien Mountains. They are mystic and magnificent and look like soaring castles and towers, monuments and cathedrals with chasms that plunge straight down. It was the start of the rainy season and there was a hint of green on the mainly brown slopes. Everywhere the farmers are preparing their fields. I see two bullocks pulling a single plow shear with the farmer usually yelling and using a whip from behind. The land is extremely rocky and where they have cleared it, there are rows of rock walls between the fields. Everywhere the fields are prepared; in one I see a farmer sowing seed. It rained on Sunday when I was in Axum and Tuesday in Gondar, but everywhere is very short of water as there has been a drought for the past 2 years. The journey continues to Lalibela, home of the monolithic churches carved in the ground out of solid rock. They really are impressive. Inside there are columns and arches, just like you see in the old European churches. One group of 5 churches is joined by tunnels also hewn out of rock. Apparently all 11 were made in the same period. It must have taken armies to complete the task. Legend has it that the angels helped King Lalibela at night!! Time for a mule ride up to the top of that mountain (way up top). It would have been easier and more comfortable to walk and when it got steep, I did just that. But it�s still amazing what a steep incline the mule can climb with my weight on it�s back. It�s no wonder they are used throughout Ethiopia. The churches carved out of rock on top of the mountain were smaller, but still impressive. Not as well finished, I could see the chisel marks in the walls. The view from the top was inspiring, but in September, when all is green, I�m sure it�s even more impressive. There is one road heading to the next town 130K away and another the other direction 180k. Lalibela has no gas station or maintenance shop for vehicles. The airport, rebuilt 4 years ago, is 28k away on the only flat land available. They only got electricity 24 hrs/day 4 years ago. Before that they had a generator that provided about 6 hrs/day. Still they have 2 days/week without power and hot water is in short supply. Life must be difficult in the region. Looking down from above, there is a small village of farmers. They care for the priests and monks in the churches and bring them food. As we walked up and down, I could see lines of people marching down with hay, wood and other items on their backs or heads, to sell at the market that day. The children also make the trek daily to school in Lalibela. It took us 1 hour up and 45 minutes down � now that�s a long walk to school everyday!! Last stop on the tour, Bahir Dar, perched at 6000 feet next to Lake Tana, the source of the Blue Nile River which later merges to become the Nile at Khartoum. It is home to some 20 monasteries and churches. Sitting by the lake was very restful; however other issues proved to be quite frustrating and it was time for the touring to be over. I returned to Addis the next day and was so happy to see my Mooney on the ramp. I went straight to ATC to file my flight plan and couldn't wait until tomorrow to get to my plane, so I crossed the ramp and checked that all was okay. Although dirty and dusty, she was ready to fly again, and I can't wait for tomorrow. We'll be off to Djibouti for a gas stop. Then a long hop to Greece. It�s heartwarming to see the number of fundraising drives for ALS. I�m sure many of you saw Tom Watson�t caddie Bruce Edwards at the US Open. What teriffic publicity for ALS. I feel sorry for Bruce because I know what he�s destined to go through, but let�s hope that all this leads to more donations and eventually finding a cause and cure to this devastating disease. My real work on ALS awareness will begin in Europe where I�ll meet country chairmen for ALS foundations in France, England, Ireland and Scotland; then more after I cross to Canada. Nothing was planned for Ethiopia, however, I had 3 new email contacts with respect to ALS during my time here. Max with FSTA in Lusanne, Switzerland, contacted me about my trip. Their previous president of the International Parachute Commission died of ALS a few years ago. It was a blow as well as a learning experience for the whole group. They miss him terribly and support the drive for more ALS awareness and donations. They sent their best wishes and hope that I will be able to visit; which I will try to do. Larry from NY City contacted me about an ALS fund raising in NYC on October 2nd. I said that I�d be there!! Absolutely. His brother�s wife, Toni, is trapped in her body as ALS has taken all her muscles. She can just barely communicate with her husband through eye movements. They started Wings over Wall Street two years ago and have raised over $2M for this worthy cause. I�m looking forward to participating and hope that we can raise even more this year. Before arriving in NYC, I�ll be visiting the ALS-TD Foundation in Massachusetts. This is the foundation that my mother chose for donations to go to as they are doing research on a cure for this disease. I also received an email from Susan in Canada. There will be several ALS fund raising and awareness events in September. As I pass through Nova Scotia, New Brunswick and Newfoundland, I�ll participate in as many as possible, especially the walk-a-thon to WALK TO D�FEET ALS. Many thanks to those of you who have donated to help find a cure to this disease. If you are enjoying these flight reports and haven't yet donated, please consider sending a donation. Just click on the Dedication and Mission page, or visit the donation web site, or send a check to the ALS Therapy Development Foundation, 215 First St, Cambridge, MA 02142. Thank you.